We’re on the hunt for the best patio heater we can find. In the extensive review we’ve tried, tested a wide range of patio heaters, from cheap ones to expensive ones, in all different shapes and sizes. From propane or gas heaters, to electric, tabletop, wall-mounted, full-sized, pyramid shaped, we’ve pretty much tried everything that is out there to find the very best patio heater money can buy. We’ve all been there… A time when you just weren’t quite ready to go inside yet. A few more pages to finish reading, a half glass of wine left in the bottle, or your party guests slowly migrating inside to avoid the nighttime chill. Having a patio heater can really extend your time outdoors and keep everyone comfortable and warm, perfect to have around when the weather starts to cool down and get a bit chilly. It’s great to have not only for yourself and your family, but your guests will definitely enjoy it as well when you have them over. It can be a bit overwhelming when trying to choose which patio heater to buy, but not to worry, we’ve done all the research and legwork for you! A patio heater is great for any type of space that you have, whether it’s for your home, outdoors, restaurants, or workplaces. We are passionate about anything related to our home and patio space, and are always on the hunt for the best that is out there, and we love testing and reviewing new products that hit the shelves. Want to find the best patio heater for your space? We’ve made it easy by listing the best patio heater by type. We’ll show you the pro’s and con’s of each type, as well as each model, to help you make the best purchasing decision. Freestanding patio heaters are by far the most popular style, as they provide the most heat, and are portable in that you can move them around your outdoor space fairly easily. Fueled (propane or natural gas), and electric powered models provide a wide range of options to fit your home and outdoor space. Wall mounted patio heaters are installed permanently onto a structure, but provide added safety, and are great for smaller patios where your furniture doesn’t move often. Electric (infrared) models are the most popular as they are easy to install, and are indoor/outdoor friendly. You’ll save money by using an electric outdoor heater, as they cost less to operate than traditional propane heaters. A thermostat is usually not available, so On or Off are your only options, however most models will come with a way to adjust the direction of the heat through an articulating arm similar to a TV mount. These heaters will provide sufficient heat only up to about 4-5 feet. A roll cage, which the heater is mounted and sits on the floor may be purchased for increased portability and control. Hanging patio heaters are great at providing 360 degrees of heat without taking up any valuable floor space. All hanging patio heaters run on electricity, and therefore have low operation costs. In our testing, we’ve found these heaters to provide ample heat for around 6-8 people when hung 3 feet above our outdoor dining table. They also cast a nice warm glow, which is great, and naturally draws guests to it. Pro Buyer Tip: When not in use, hook the heater onto itself, so the heater is as high as possible to prevent the heater from swinging from windy nights. Table top heaters are ultra portable and perfect for outdoor dining and are available in propane and electric. The propane models run off a 1 lb propane tank which lasts approximately 2-3 hours on the highest setting. Electric tabletop heater models may be used indoors as well, which may be great for use in a covered patio, or even your garage with plug and play convenience. Pro Buyer Tip: If you’re concerned about constantly switching out the 1 lb propane tanks, you can purchase an adapter and hose which allows you to connect it to a full 20 lb propane tank. Having a patio heater for your open or enclosed outdoor space is great to have around to extend your time outdoors and it definitely helps beat the chill. It makes spending time outside much more enjoyable and comfortable for yourself and family, and really sets a nice ambience when you have guests over. Most people spend a reasonable amount of time in their backyard or outdoor space, so a patio heater is a great investment for your home. It is priced reasonably, and is a practical household item that you will probably ending up using a lot more than you think. Of course there are some expensive heaters out there, but we have also reviewed and tested some very inexpensive ones that we love and highly recommend. It’s safe, easy to use, and you can choose from a wide selection of patio heaters that use propane or are electric. These heaters offer a range of power options, which can be easily adjusted from a fairly low to high temperature. The electric heaters do need to be plugged into an electrical outlet, so make sure you have an outdoor electrical outlet, or an extension cord that is long enough to where you want to place it. Make sure you are aware of the cord and that it is placed somewhere easily visible or safe so no one trips over it. The propane heaters are a little more flexible because you don’t need to plug it in, you have more flexibility as to where you can place it without worrying about wires and electrical outlets. Be sure that you have enough propane or a backup tank just in case, especially if you’re having guests over. There are so many different styles to choose from, from wall mounted, tabletop, hanging, and full sized heaters in a pyramid or the traditional umbrella style. To help figure out what size works best for you, we recommend to first assess your space to figure out the size and area that you want heated. If the area is partially covered, factor in the distance between the ceiling and the top of the patio heater. If the patio heater will be placed outside by your patio furniture / sitting area, keep in mind how far you need the heat to reach. Our chart below shows the heating radius and dimensions of each patio heater we have reviewed and recommend, which will help narrow down the right options for you. A table top patio heater is also a great option if you are in an enclosed area, or just want a smaller space warmed up. The nice thing about the table top heater is that it can sit on your patio table and keep everyone around it nice and warm. It’s a great option when you have a few people over, or just want to use it for yourself when you’re relaxing outside and it’s a little chilly. There are electric and propane table top heaters, here are the best ones we have tested and reviewed. Wall mounted patio heaters also work well for an enclosed area or partially enclosed area, and are very safe. The nice thing about them is that they are mounted and don’t take up any space, perfect for small spaces. The heat is directed downwards, so you have to sit fairly close to feel the heat. Just keep in mind that they are mounted, so they aren’t portable and can’t be moved easily. Full size patio heaters are the most popular, but every space is different, so choose the best option for your needs. If you have the space, they are great because you can adjust the heat for just a little bit of warmth to keep things cozy, or turn it up to full power for colder nights or when you have more people outside. It’s a little tricky figuring this part out, there are a few factors you need to consider, and make a few calculations. To make things easier, we composed a chart to make sure that the patio heater you have chosen is the right one for you. Choosing the patio heater that has enough power and BTU’s will save you a lot of time, hassle, and money. What is the temperature at which you’ll be using the heater? Are there any obstacles or obstructions in the way? How many people will be surrounding the heater? Do you require a directional or surrounding heat source? It doesn’t hurt to overestimate a little, and buy a patio heater that is a little more powerful, as the BTU’s provided by the manufacturers are usually for ‘ideal conditions’. If there isn’t a patio heater out there that is strong enough, you can always buy two! In our experience, if you have a large space you want to heat up, it’s better to have 2 patio heaters set on a medium – high setting, than just 1 heater on the highest setting. If you are trying to determine the number of watts you will need, you can make a fairly simple calculation. Take the radius (in feet) of heat that you want projected from the heater, and multiply this number by 100. Similarly with choosing the BTU’s, we recommend that you choose a patio heater with a higher wattage than what you need, so you will have enough heat, and everyone around it will be comfortable and cozy. Outdoor patio heaters are used to create warmth by heating up a element by burning a fuel source such as propane or natural gas and turning it into regulated heat. Other power sources include electricity which also heats up an element similarly to fuel options. All patio heaters emit radiant heat without the use of fans or forced air. We’ll go through the various power sources below in more detail. Piezo Ignition system is found in many portable camping stoves, and produces a clicking sound. An electric spark is produced using a spring-loaded hammer which produces a high voltage discharge which ignites the propane or natural gas in your patio heater. Electric Ignition system can be found in some patio heaters, and require a battery (typically one AAA) to operate. The benefits of an electric ignition system for your patio heater is that you can hold it, while it continuously attempts to ignite the fuel. Propane patio heaters are the most popular type as they are portable and easy to find refill locations such as gas stations or convenience stores. The downside to propane is that you need to purchase a separate tank for each heater you own and can be more costly to operate than electric or natural gas. Natural gas patio heaters are great as more and more houses come outfitted with natural gas lines. This makes it very convenient to hook into, however it is less portable than propane. Extension hoses are available, but can be a tripping hazard especially after the sun has gone down. Electric patio heaters are a great choice for easy setup, and has indoor applications as well, for partially enclosed indoor-outdoor space. Electric heaters are typically generally a bit weaker, therefore it’s best for a small group of people. Patio heater safety concerns such as tipping, ventilation, and proximity to other objects must be considered. Whether you’re working with gas, or electric patio heaters, below are some safety tips and common features. In our experience you should always consider the location, proximity, people (especially children), and pets. Children should not operate patio heaters or be left unattended near the heater. Tabletop heaters should be used near the center of a sturdy table. Tabletop heaters have a lower center of gravity, and are more prone to tipping, therefore should never be used on the floor. Patio heaters are for outdoor use in well-ventilated areas only and must not be used indoors unless specified by the manufacturer. Do not use during high winds. Wind can blow out the flame leaving the gas on or even tip over the patio heater. Ensure you know how to turn the patio heater OFF before you turn it ON. Keep patio heaters a good distance from walls, ceilings, and other structures. A suitable distance will be specified by the manufacturer. Do not move the heater while it is lit. Below are some common patio heater safety features. Please read your owner’s manual to see what safety features are included with your particular model. As you might have guessed, this really depends on how often you use your patio heater, as well as the heat output you’re looking for. With a propane tank, it will last a lot longer on a lower setting, than if you have it on at full blast. To make this as simple as possible, the information below outlines what it would cost for a 6 hour operation, at maximum temperature. Patio heaters are best used outdoors on your deck, patio, balcony, backyard, or front porch. They can be used in an enclosed area but be careful and make sure you read the user manual. Smaller patio heaters can be brought on trips and used in the outdoors, ie. camping, etc. Can I use the patio heater in an enclosed patio or indoors? A common question our readers ask us, is if patio heaters can be used in an enclosed patio. The short answer is yes, but be careful. Read the user manual or contact the manufacturer if it is unclear. You need a minimum distance between the top of the heater and the ceiling, and the surrounding radius, which varies with different brands and models. If it is too close, it can melt or be hazardous to anything that is close to it. Take extra precaution if you are using a natural or propane patio heater, but if you are safe and follow the instructions, you will be ok, we have used it ourselves, and so have a lot of our readers. If you want to play it safe, your best option will be an electric patio heater, which works great in an enclosed area! Can I use the patio heater on grass or an uneven surface? We definitely do not recommend placing your patio heater on grass or any type of uneven surface. Although they are sturdy, and you can put extra weight in the base (like sandbags) to make it stronger and sturdier, it can be accidentally knocked over just that much easier when it is not sitting on a flat, solid surface. It is definitely a safety hazard and we always recommend to play it safe. We’ve found that the best place to buy patio heaters in on Amazon. They have the best return policy, and offer free returns, which are easy and hassle free. It really gives you confidence in your purchase, and peace of mind when buying online, because you know you can return it for a full refund if you are unsatisfied. PLUS you can receive the patio heater in 2 days if you have Amazon Prime, which is awesome! We also love that you can read real reviews from people who have bought the product on Amazon. There are hundreds, sometimes even thousands of reviews for a product that you are eyeing or planning on buying. The patio heater that is the best bang for your buck, is definitely the Fire Sense Commercial Patio Heater. It has hundreds of reviews on Amazon, and an average rating of almost 5 stars, which is pretty amazing. It has all the features you are looking for, strong heat output at 46,000 BTU’s, durable stainless steel burners, piezo ignition which makes it easy to start up, and an auto shut off tilt valve for safety. It is not expensive, and you can’t beat what you get for what you’re paying. This patio heater is definitely one of our favorites. Aesthetically we like the pyramid shaped patio heater more, and the AZ Patio Heaters Pyramid Shaped with Quartz Glass Tube is at the top of our list. Even though they are usually slightly less powerful (unless you go with a pretty pricey one), but you definitely get a bigger wow factor with this impressive looking patio heater, and we get tons of compliments when guests come over. It is more expensive, but still has great heat output at 40,000 BTU’s, it is good quality, easy to light, and it is very safe as the flame is enclosed in the gas tube. Not only does it have an anti-tilt feature, but it is more sturdy and less likely to topple over in comparison to the traditional umbrella-style patio heater. The Fire Sense Commercial Patio Heater is the definite winner for us. The instructions were clear and easy to follow, plus the smaller parts were all individually blister packed and labelled. We didn’t need to guess which nuts and bolts go where, and all the holes lined up perfectly, which made assembly a breeze! Another option you have is if you purchase your patio heater on Amazon, you can pay more for an ‘Expert Assembly’ option, and they will have a professional assemble it and check it for safety, so you don’t need to bother with instructions or parts. We have always had good customer service experiences from AZ Patio Heaters, they offer a pretty standard 1 year warranty and we like that their customer service office is based here in the US. Lava Heat Italia also deserves shout out because they offer up to a 5 year warranty on most of their products as well. Realistically it would be pretty hard lugging around / transporting a full sized patio heater, and a huge pain disassembling and reassembling it, so your best option is using a tabletop heater because of it’s size. The Napoleon Tabletop Patio Heater is our favorite and we’ve used it numerous times on camping trips and outdoor activities. It also uses propane, which is pretty handy, and you don’t need to find an electric source to plug it in. This is the one thing we highly recommend buying for your patio heater. It will protect it from the outdoors and damage, keep it in better condition, and your heater will very likely last longer as well. We've tried quite a few different patio covers, but our favorite one is the Classic Accessories Ravenna Stand-Up Patio Heater Cover - Premium Outdoor Cover with Durable and Water Resistant Fabric. A few reasons why this cover is our favorite: it is not expensive, the material is very good quality compared to other covers in a similar price range, it's super easy to use, and it comes with a lifetime warranty. You simply put the cover on, there are 2 zippers on either side which makes it easy to zip up, then use the velcro straps and bungees to keep the zipper tight when closed, and then tighten the adjustable elastic hem cord on the bottom for a tight fit. The material of the patio cover is heavy duty and water resistant, with double-stitched seams for durability, and a UV coating and water-resistant PVC backing to keep your heater dry. Another great feature is that it has air vents lined with mesh barriers, which keep the elements out, prevents wind lofting and mildew, provides ventilation, and lowers condensation. 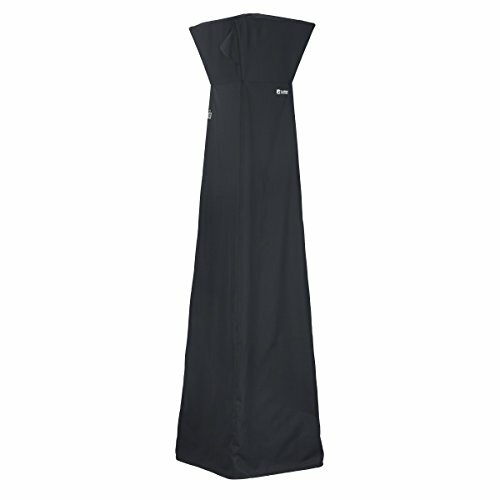 Dual zippers on both sides of the cover also make it super easy to cover and uncover your heater. 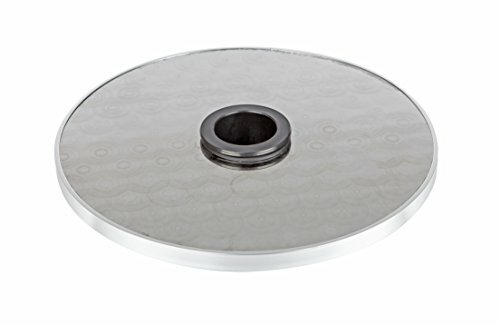 Fits patio heaters that are 95" high x 34" diameter dome x 18.5" diameter round base, with or without adjustable table. If you are looking for a pyramid shaped patio heater cover, they have it available as well: Classic Accessories Ravenna Pyramid Torch Patio Heater Cover - Premium Outdoor Cover with Durable and Water Resistant Fabric. Everything is exactly the same as the above, except for the shape of the cover. They guarantee that it will fit stand-up heaters that are 95" high x 34" diameter dome x 18.5" diameter round base. 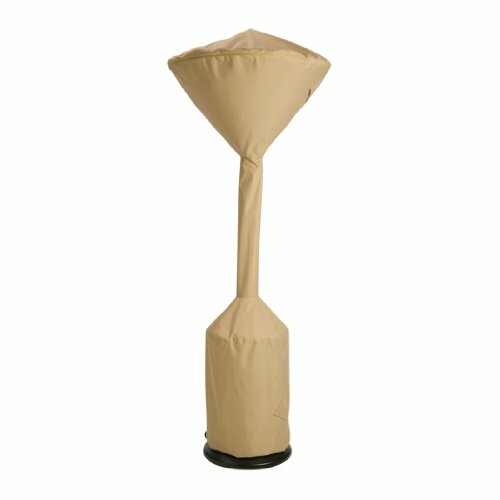 If you want to save a few dollars and don't really care too much about your patio heater cover, we recommend the: Classic Accessories Terrazzo Stand-Up Heater Cover. This is a good, basic patio cover, that does the job. It is made of a Rain-Tite fabric, which protects against water, snow, dirt, and sun, plus it won't crack in cold weather - like some of the other covers we've tried. The company offers a 1 year warranty and it will fit any round stand-up patio heater that is 34" diameter dome x 18.5" diameter base x 95" high. 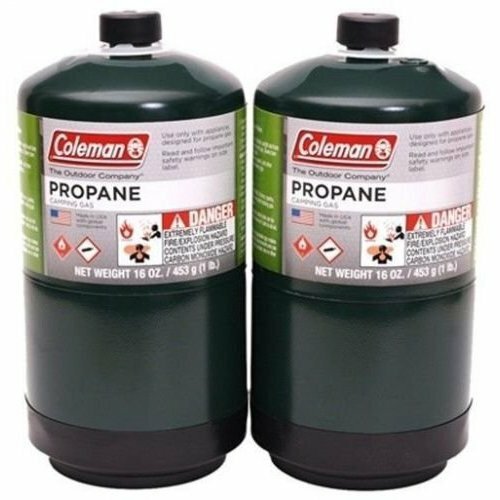 For your tabletop patio heater, we recommend the Coleman Propane Bottles. They're reliable, super popular, safe, and highly rated. A portable heater adapter is best used with propane tabletop heaters, because it lets you you hook up a 20lb propane tank to a 1lb connection. You can enjoy the heat from your table top patio heater for much longer without having to change the propane bottles as often. 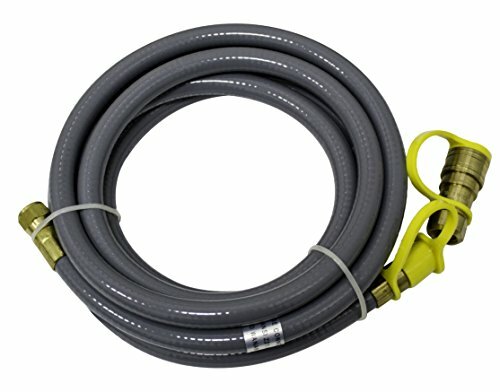 This 12 foot gas hose works with natural gas and can also be used with low pressure propane. 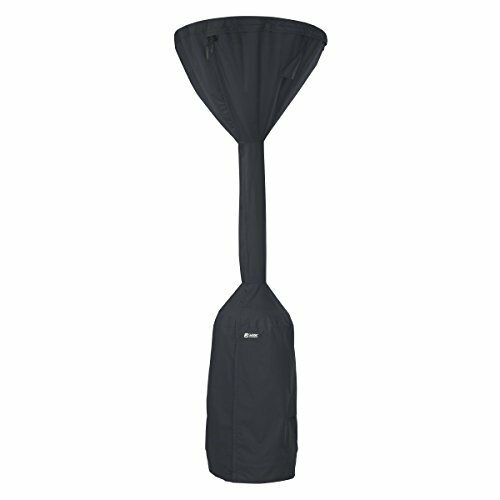 It has a ⅜ inch thread, quick-disconnect feature, and a flexible high pressure line. 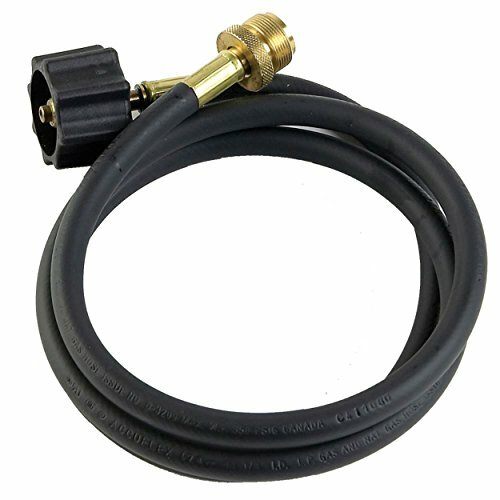 You can hook this up from your propane tank to your patio heater easily, just note that the quick connect hoses cannot be connected together unless you have a male to male union, which you can find at most hardware stores. This is by far one of our most favorite patio heater accessories! At first we were on the fence about buying this, because we didn't think we would use it often, but we actually use it all the time, and our guests love it when they come over. We pull up a few chairs around the patio heater and use this as a table to put our drinks on, and everyone is warm and comfortable. It's fully adjustable, so you can adjust the table to the height you prefer. The table has a base diameter of 16", and it is very sturdy, so you don't have to worry about your drinks tipping over accidentally. This Heat Storm Roll Cage Stand is a great heavy duty stand, made of steel, is rust-free, and is completely portable. Use it to protect your outdoor heaters from damage at busy job-sites, garages, and shops. It is made especially to be used outdoors and for commercial use, and can be used indoors as well. Dimensions: Height (Top to Bottom): 15.5" x Width (Side to Side): 29" x Depth (Front to Back): 13.5". Weight: 4.5 lbs. The Heat Storm Tripod Stand is a heavy duty stand made especially for their outdoor infrared heaters, to be used outdoors or for commercial use, and has a special coating to keep it rust free. The stand is fully adjustable, it extends up to 6'5" in height to fit your needs and also comes with a cord wrap which makes it easy to store. It is also portable, which makes it perfect for busy jobsites, garages, shops, etc. 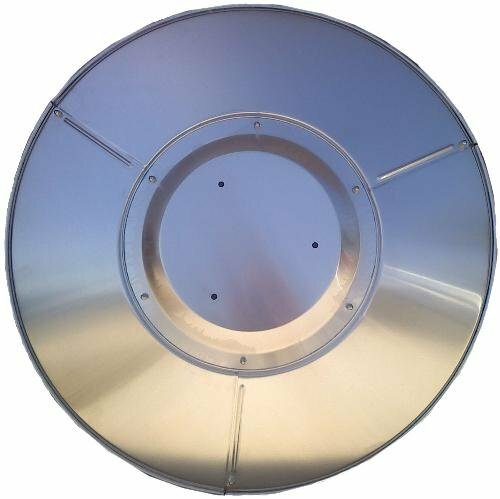 This is a replacement reflector dome top for tall patio heaters. It will fit all patio heaters, but in some cases you may need to drill additional holes to match the hole pattern of your particular patio heater.